Riot police use tear gas in front of the Greek parliament on July 15, 2015, in Athens, Greece. Police armed with tear gas clashed with protesters armed with petrol bombs outside the Greek parliament in Athens today, as inside, a strikingly unenthusiastic Prime Minister Alexis Tsipras pushed his allies to support a controversial slate of austerity measures demanded by the country’s European creditors. 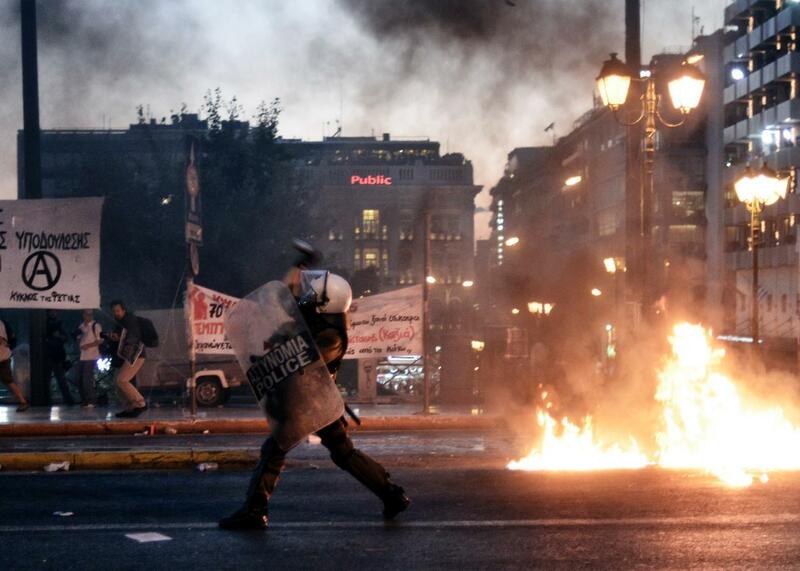 According to Reuters, the clashes are Greece’s most serious street violence in three years. The measures, which members of parliament have now gone past midnight debating and include tax increases and a raise in the retirement age, are a condition for the $94 billion assistance deal reached between Greece and its creditors on Monday. Tsipras has said that he does not believe in the measures but is asking members of parliament to support them to avoid economic ruin. Today’s events are the latest twist in a roller-coaster couple of weeks that has seen Tsipras reject a bailout agreement, hold a national referendum that supported his position, and pull an about-face and agree Monday to most of the terms he had previously rejected. Monday’s agreement was seen as a betrayal by many supporters of Tsipras’ left-wing Syriza bloc. As least 32 members of the coalition’s 162 members in parliament are thought to be voting “no.” Nonetheless, the measure will likely pass thanks to the support of the pro-European opposition, though if there’s a significant revolt among his own supporters, it’s conceivable that Tsipras’ government could collapse. The anti-austerity crowd got a boost today with a report from the IMF calling Greece’s debt load “highly unsustainable” and saying creditors should give Greece major relief on its existing debts. The report will be seen as vindication for Tsipras’ opposition to the European position on the bailout, though at this point it’s getting a little hard to keep track of his position.